PATRIARCH PAVLE I, SUPPORTER OF KARADZIC AND MLADIC, ESCAPES "EARTHLY JUDGMENT"
After hearing Serbian Orthodox Patriarch Pavle I, who has just died in his 96th year, praised as an “ecumenist” by the Pope and a “man of peace” by the German Catholic Archbishop Robert Zollitsch, Gesellschaft für bedrohte Völker (GfbV) / Society for Threatened Peoples (STP) has expressed regret that the Serbian Orthodox Church’s Patriarch has escaped earthly judgment. 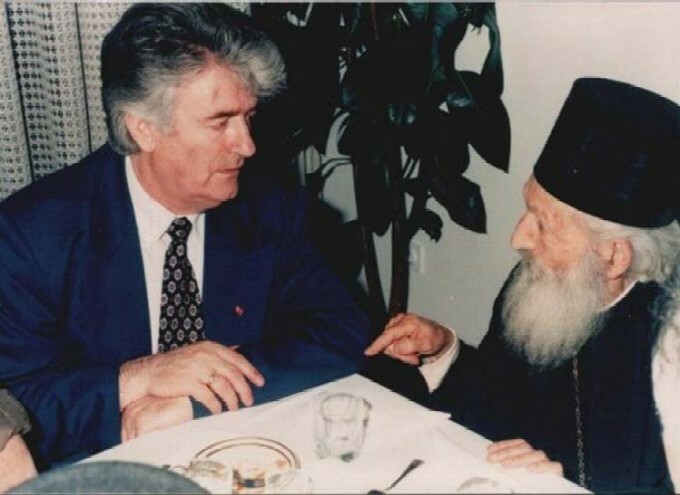 GfbV/STP President Tilman Zülch observed that “Pavle maintained very close and friendly relations with the two major Bosnian Serb war criminals Ratko Mladic and Radovan Karadzic during the time when they were imprisoning more than 200,000 Bosnian Muslims and Catholics in concentration and detention camps and 20,000 Bosnian Muslim women were being systematically raped”. The Patriarch remained silent as Serbian troops commanded by the two war criminals destroyed centuries-old mosques and madrassas (a total of 1186) and over 500 Catholic churches and other religious buildings. Throughout Serb-occupied Bosnia only a single mosque was left standing. Pavle, who conferred his blessing on the war criminals on a number of occasions, later sought to gloss over his support for genocide in Bosnia-Herzegovina later with vague declarations in support of peace. Pavle’s macabre involvement is illustrated by the photograph above which shows him blessing Radovan Karadžić (currently before the International Criminal Tribunal at The Hague) and Ratko Mladić (protected for years by the Serbian authorities and the Serbian Army). “We are still waiting for Archbishop Zollitsch, a child survivor of a Tito concentration camps where thousands of Danube Swabian women and children perished, to show some respect at least for the victims of Sarajevo and Srebrenica”, Zülch added.